First off let me just say 'I make no apologies. I love Mary Calmes' I have a small group of authors that I'll just read whatever they write and the reasons may vary but mostly it's the entertainment factor and just the fact that for whatever reason I can easily escape into the story and enjoy it without a lot of deep thoughts or intellectual rhetoric involved...sometimes a girl just wants to read a story that's entertaining and with Mary Calmes that's what I get entertainment...pure and simple. Now, I'll be the first to admit I don't particularly care for vampires...in the world of the supernatural they're near the bottom of my 'want to read' list but it's Mary Calmes so I'll try anything once and in this case 'love it'. I can't say that there's just one reason that I had so much fun with this one, it's more like there were a number of different things that came together at the right time for me. I liked both of the MC's Jason Thorpe was the expected 'eveyone loves him' MC and I liked wandering through the first part of the book as his history and character were layered onto him and we got to see how he came to be in New Orleans and the events that slowly converged to bring him together with Varic Maedoc, Prince of the Vampires. As well as getting to know Jason the author had a vampire world to create since her vampires have a bit of a different origin than other vampire stories have given us. Plus we were given a few secondary characters that I really enjoyed Jason's friend bampyr friend Cooke, Leni and Ode, but most of all I would love a book for Tiago and Hadrian...those two were probably in fact my favorite pair in this story more so than even Jason and Varic. There was a definite Vampyr Politics theme running through the story that drove not only the romance but the mystery/action part of things as well. There was a part of this that was a huge undertaking in its own right and that was setting up the social structure of the vampyr's and their language and then putting it into a book in such a way that it didn't totally drown everything else and for me being able to wander through things with Jason. Learning as he learned kept things from becoming overwhelming and boring. I was delighted by how fact that vampyr's weren't portrayed as a society that lived under a rock and that they not only knew about technology they used it...this to make far more sense than having modern day vampires who are still residing in the dark ages as is sometimes the case. While may of the vampyr stereotypes were tossed out there were also some that were kept...not many but one or two. I can't say with a certainty that whether this is a standalone or the beginning of a series. There are no indications of future books being planned but the story certainly presents the opportunity for them...so I guess time will tell, won't it. 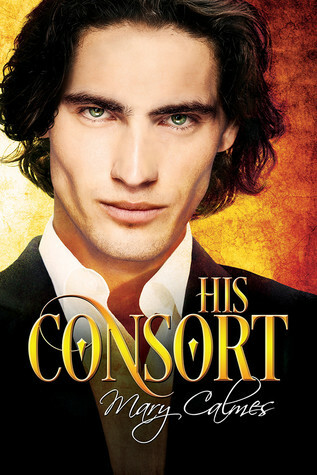 A copy of 'His Consort' was graciously provided by the publisher in exchange for an honest review.